Do you know if this applies to the 7th Gen HX as well? I can feel my '01 HX stumble/surge as the rear O2 sensor drops to 0.000 and back, which I understand to be indicators of lean burn. The original owner of my car was in California, so I believe mine is a California car with Lean Burn. It even has a sticker on the window indicating ULEV - 50-state/CARB legal. I don't know, but I believe the 2000 Insight had LB and was not only legal in Cali but was categorized as an ultra low emissions vehicle under state law. I would guess that Honda had figured out how to improve emissions enough to qualify all their lean burn engines in Cali and so, I guess, maybe that explains how the 7th gen Civic (2001-2005) was CARB qualified. Soo do you think you can send me a like to where you got your mpgino and where you got your calibration and instal info? let him know i referred you to him! thinking more about what gauge i like better..... I basically use the UltraGauge for its digital tachometer function. by look at the digital tach, i can tell very accurately if i'm accelerating (slightly), or decelerating - and use that info to apply a hair more or less gas, depending on the road situation. the Ultra is also good to keep track of intake temp, and engine load. but the MPGuino is soooo useful for its fuel data that it gives. you are going up a hill. you want to be decelerating very slightly, so you watch the UltraGauge digital tach to make sure that is happening. as you crest the hill, you want to start to level out the tacho so you are not gaining or losing RPM. then on the way down the hill, you want to watch the MPGuino to make sure you are still getting good MPG when you *slightly* accelerate down the hill, once you have accelerated to your desired max speed, put car in neutral and coast down the rest of the hill (or EOC). and watch the MPGuino go to insane numbers for instant MPG, and your overall trip MPG will go up way fast as a result. Last edited by SpeedyCorky; 09-28-2012 at 07:56 PM..
alright man, i ordered one up and told him you referred me, thanks again for answering all my idiotic questions!!! 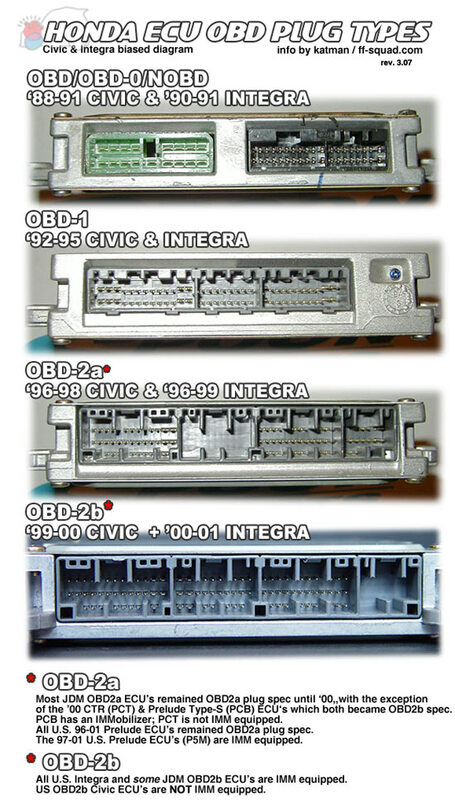 Hey man, incase if you didnt know the 96-98 civics are obdII-a and the 99-00's are obdII-b. the plugs are very different on the ecu's. They make jumper harnesses for them but those are like 150 bucks at least I think.. Sorry to double post. Here's the ECU comparison. Holly crap I feel like a total idiot for stearing you in the wrong direction. Check this out. Apparently 99-00 hx's are obd2a. Who would have thunk it? Idk. I just threw some of the other links on here for you as we'll. I don't want you car blowing up. It just past smog a few weeks ago and I was surprized because I thought the nox from leanburn would show up too high but it was okay.California hx cars do have leanburn its just very very slight. My best trip avg was about 38mpg with the 37820-p2n-A21. So I was about to put in the new ecu when I realized the one in my car WAS a Federal ecu! How could I be getting such bad milage in a HX with fed ecu, and for that matter how did I pass California Smog Test? then it dawned on me that some one must have reprogrammed it, it drives fast and vtec is very easy to get into. I now have installed my new p2n a22 and its great! I took a 90 mile trip today and only used two gallons of gas= 45mpg. Cant wait to buy mpguino to fine tune my driving habits. get a UltraGauge as well. the #2 o2 sensor reading will tell you when you are in lean burn. and the TPS will give you info too. below 20% it will pop into lean burn, above 20% it wont. once in lean burn, keep the TPS below 30% and it will stay in LB. getting into, and staying in LB is the key to MPG w/ the HX. the UltraGauge will help A LOT with this!